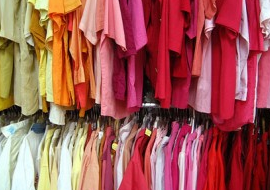 Thrift store shopping is a great way to practice your 3 R’s – reduce, reuse, and recycle. Reduce – Purchasing a used item rather than a new one reduces the amount of new inputs to the environment. It also keeps all of those items that were in thrift store out of landfills. Reuse – Most items at thrift stores are in good condition and can be reused. Children’s clothing and toys are especially good examples of this most children only wear their clothes for a limited amount of time before they are outgrown. In addition, some stores such as Plato’s Closet specialize in gently-used high-end clothing. Recycle – Thrift-store items can be recycled, or should I say up-cycled! Thrift-store goods can be given a second life by being turning into something new. Like home furnishings (pillow covers, curtains, etc. ), kid’s dress-up outfits, Halloween costumes, and outdoor work clothes. Plastic Dustbin is so useful.thanks for your share.